Aside from being a good blogging tool, WordPress is also a lightweight content management system that can be used to run such diverse sites as news or magazine publications, personal and organizational websites. I recently started accepting paid web development work and website management. 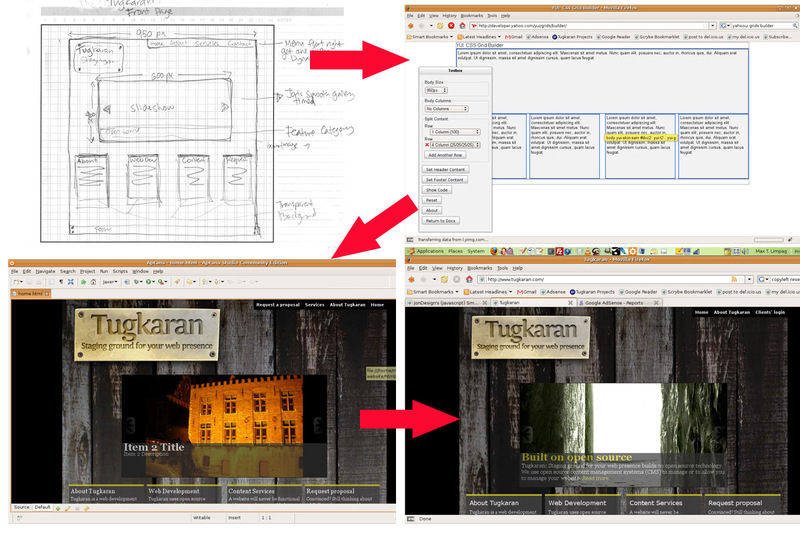 Several weeks back, I bought a domain, Tugkaran.com (from the Bisaya word for staging ground), and created a static HTML page as placeholder because I did not have time to configure WordPress to run the site. FROM SKETCH TO WORDPRESS DESIGN. The steps I took from planning a site to deploying a custom WordPress theme for it using Yahoo UI Grids Builder, Aptana, and Bluefish. But when one of my projects was about to go live, I needed to quickly build Tugkaran because I already placed a link to it in the footer. I spent whatever time I could spare from newsroom and web development work building Tugkaran, 30 minutes or so here, an hour there, a few minutes here. It took me five hours to go from sketching the site on paper, protoyping the design in HTML, and setting up WordPress with the custom theme. The site was designed “live.” Developing it locally and then replicating the work in the server would take more time—which I didn’t have. The Tugkaran website still needs a lot of work but it will do for now. I’ll polish it when I have more time. If you want to study the files I worked on, you can download it at the end of this post.